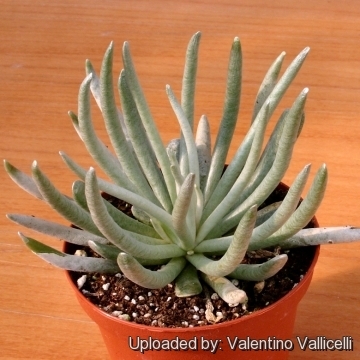 This is one of the most attractive species with dazzling bright silver white succulent leaves that looks sort of like an ice plant but on small, woody stems and the flowers are also nice. Origin and Habitat: Little Karoo in the Western Cape to the Kei River in the Eastern Cape, South Africa. Habitat and ecology: This species grows on ledges of sandstone cliffs, on steep slopes of rocky hills, and along dry river valleys in Albany Thicket and Eastern Valley Bushveld biomes, in sandy, mineral poor and acidic soil. The young leaves have a white to silvery felted coating which may be shed as they get older. This felted covering is an adaptation to the dry conditions under which the plant grows and serves to reflect the sunlight, preventing over-heating or burning. Cacalia tomentosa Eckl. ex DC. Cact. Succ. J. (Los Angeles) 62(6): 283 (1990):." 283 1990. Senecio scaposus var. caulescens Harv. 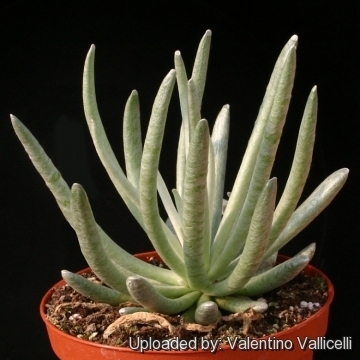 Stems: Very numerous, simple, very short (often elongatin in cultivation) from a multiple caudex. 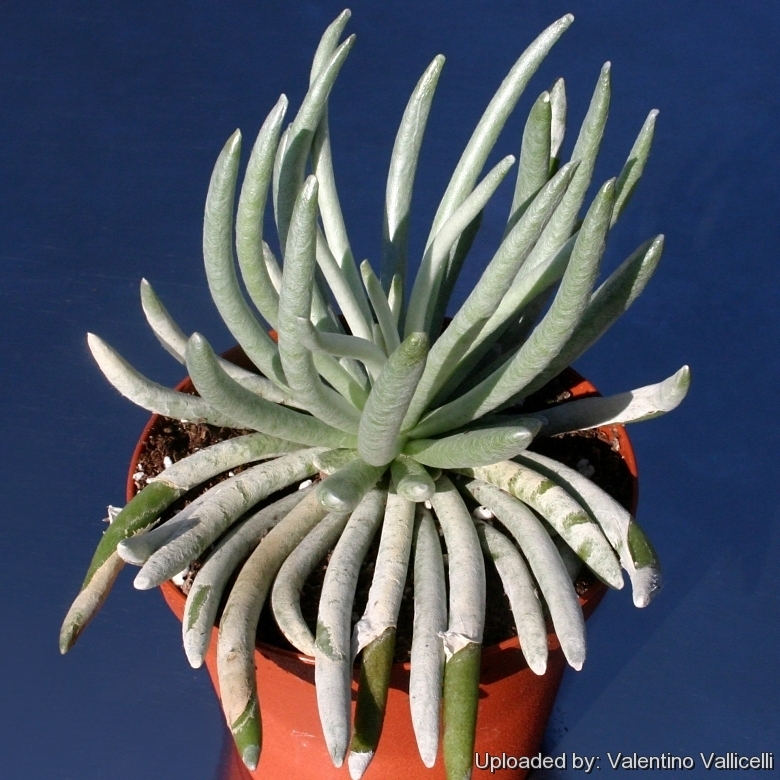 Leaves: Crowded, long, cylindrical, straight to banana-shaped, inwardly curving (3-)5-10(-13) cm long, 4-7(-10) mm in diameter, that angle upward in tufts and grow in a tight rosette. Tip acute or somewhat spatulate. 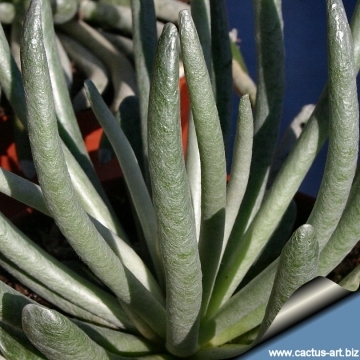 The young leaves have a bright silver coating (a sort of felt) at least when young, with patterned patches of a waxy light blue on a light green background .They can actually be pealed off revealing the green, succulent leaf below and become a smooth green when they get older. Inflorescence: (1-)3-5(-6) starry silvery-yellow flowers (capitula) grow atop a 30-45 cm long stalk, simple or (rarely) branching. Flowers are showy, approx 3.5 cm accross, and resemble daisies. Each has about phyllaries 10-13, and 7-13 ray florets, with limbs to 15 mm long, yellow. Disc flowers numerous yellow. Pappus 6 mm long. Senecio scaposus DC. : is near stemless, with pointed leaf-tips. Distribution: Ladismith and Uitenhage Dist. Western and Eastern Cape. Senecio scaposus var. addoensis (Compton) G.D.Rowley: has triangular pointed to spoon-shaped or lobed flat leaf-tips. Distribution: Uitenhage Distr., Eastern Cape. Senecio scaposus var. caulescens Harv. : has stems 4 or more cm long, and leaf-tip spatulate. Distribution: Zwartkops River, Eastern Cape. 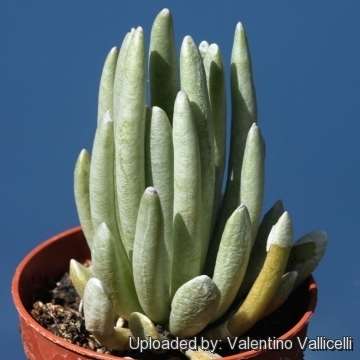 Cultivation and Propagation: S. scaposus is an easy to grow hardy succulent from high altitude. It is a great little low growing container plant. As they grow, they produce side branches. Generally, give them full sun (coastal) to light shade in well-drained soil. It enjoy more water than others but do not over-water, drench and let dry between waterings . Keep dry as possible in winter It may be grown outside in mild climates, however plants growing in small pots with well drained soil can tolerate winter rains. Hardy to at least -7°C. Senecio is a huge genus of asters with over 1500 species worldwide. Most of the succulent species are found in South Africa.